Gary Rogers; Sean Gannon, Dan Cleary, Sean Hoare, Dane Massey; Chris Shields (Karolis Chvedukas 82), Robbie Benson; Dylan Connolly, Ronan Murray (Krisztian Adorjan 71), Michael Duffy; Patrick Hoban (Marco Tagbajumi 74). 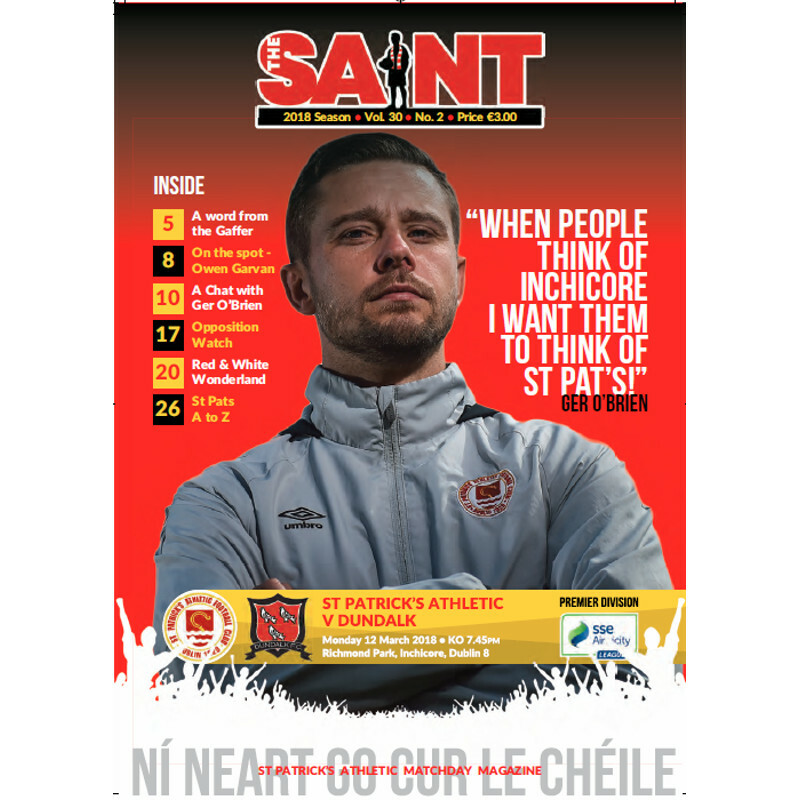 Dundalk failed to hit the target for the third time in five games as St Patrick's Athletic stubbornly held on for a well earned share of the spoils at Richmond Park. Liam Buckley's side lost all three games against the Lilywhites last season, conceding 11 goals and scoring none in the process, but they displayed a hard centre here to frustrate the visitors. After beating Cork City on Friday night, Stephen Kenny's side made the trip to Inchicore full of confidence but despite having a number of chances, they just couldn't find the vital breakthrough. Patrick Hoban bagged the winner against the Leesiders and he had the best of the openings here, the clearest of which arrived in the 11th minute after Sean Gannon's sumptuous pass found the striker in between the lines. Hoban had time to take the ball down on his chest and let fly but Barry Murphy stuck out his leg to make a fine stop. Although defensively sound, Pat's failed to test Gary Rogers throughout the opening half. Their best sighting came in the 19th minute but Conan Byrne's 30-yard free-kick sailed high over the top and out of the ground. Dundalk continued to boss possession but they struggled to break down a well marshalled home defence who displayed a lot of grit and discipline. The game needed something to spark it into life and referee Rob Rogers had to reach into his pocket to dish out yellow cards in quick succession. Dan Cleary was first into the book, the Lilywhites centre-back going through the back of Christy Fagan in the 33rd minute and Pat's midfielder Ryan Brennan followed suit three minutes later for a robust challenge on Sean Hoare. Kennyâ€™s side finished the half on top, forcing a number of set-pieces, and they were denied a breakthrough by some fantastic defending. Cleary rose to meet a Michael Duffy corner in the 38th minute and send a header flying towards the far post but Darragh Markey was there to keep the ball out. Kevin Toner did even better two minutes later, flinging himself to his right to head Ronan Murray's goal bound effort to safety after the former Galway United had wriggled enough room to get his shot at goal. Pat's started the second-half on the front foot but it was Dundalk, again, who posed a more menacing threat in the final third and they should have been a lot more clinical with a rapid counter attack in the 53rd minute. Quick feet by Ronan Murray and Michael Duffy set Dylan Connolly away on the inside left but his through pass had too much pace on it for Hoban to take it in his stride and Murphy came to clear, shipping a knock in the process. The woodwork came to Pats' rescue on the hour mark when Murray's free-kick dipped at the last minute, leaving Murphy flailing, but the crossbar kept it out with Sean Hoare's follow-up gathered by the goalkeeper. The home supporters were roused eight minutes later when Simon Madden floated a great ball to the back post but Ryan Brennan's header just cleared the crossbar. Toner then guided a Conan Byrne corner wide with a free header. Kenny introduced new signings Krisztian Adorjan and Marco Tagbajumi inside the final 20 minutes but Dundalk lacked that killer pass in the final third and the game petered out for a scoreless draw that meant more to the home support than the visitors.